Living chair in color Ice Edge with sloping armrests. 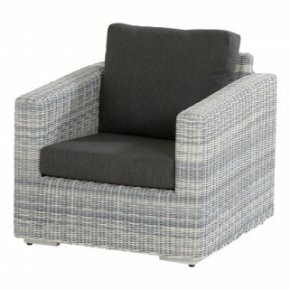 Spacious living chair with two thick cushions for relaxed outdoor seating. Wicker has 10 year warranty. 4 Seasons Outdoor living chair Edge Ice with sloping armrests is a spacious lounge chair, equipped with all-weather cushions. Edge has a strong aluminum frame, with Hularo Wicker basketry. On the Hularo wire, you get 10-year warranty on color. On the other components you get a 3 year warranty. Combine Edge lounge chair with one of the other six elements of the 4SO Edge series.